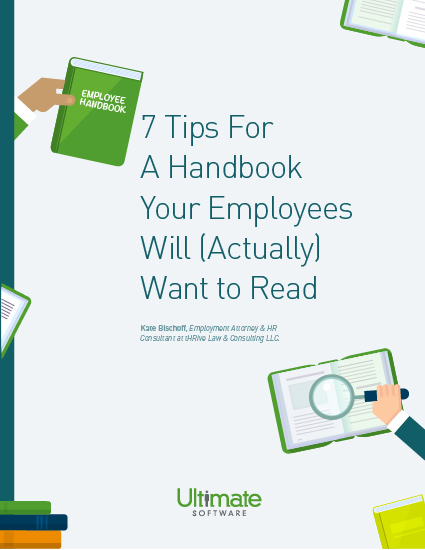 Seven tips to get your employees to actually read their handbook. Employee handbooks are vital tools for the human resource department to set expectations within your organization, but a handbook that no one reads loses all value. An unread employee handbook leaves HR professional answering questions that have already been answered. Kate Bischoff, Employment Attorney & HR Consultant at tHRive Law & Consulting, sat down with us to explore seven simple practices you can start to implement in your employee handbook companywide right now. Stop wasting materials and time, and have a handbook that is a useful tool rather than an unread document. Please fill out this brief form to access your employee handbook guide.